I've got a $100 Riedel hand blown Sommeliers Grand Cru Burgundy wine glass that's about the same size as my head, but my favorite glass still has to be the one in the picture above! What's your favorite glass for drinking wine? LOL! What makes Schott Zwiesel glasses so special? Wedding present to match our tumbler collection - Now I just need to get the white wine version. Randy, I would so drink out of a glass that said, "Forget the snob, drink like a whore"
Those are pretty cool looking! Does yours have those patterns engraved in it? Which one is your favorite? That does it! I'm going to have to get the "Wine Whore" glasses going! Would you want 'em engraved (like mine) or just printed? It's not the type of glass but more its shape...curves in all the right places making it as practical as it is appealing. What's your favorite glass, Dean? ummmm I disagree with Dean, the type of glass still makes the difference and I didn't believe it until I drank from a Reidel and plain glass wine glasses. It does make a difference. However, not to be a snob, Schott Zwiesel glasses are good too. My experience? Alas, souvenier glasses with the above stamped on their feet. Oh, btw, I forgot to say, if Wine Whore were either of the two glasses Randy, then you should offer them for sale to us... :) your anonymous friend from Wisconsin. Drinknectar must be my wedding twin. Although I think Riedel glasses are great, I exclusively use schott zwiesel glasses because they are affordable, well made and look nice. I use what we call the "Vi�a" series here in Norway. LOL! That's funny Kate! I was checking out nectar's glasses in his last video... they look pretty sweet! I think the circles one would be my favorite too! Ok, so Kate, I have to ask, what is your favorite wine to drink out of the circles glass? I have been hearing a lot about those schoot Zwiesel glasses lately, Vinosseur. They seem pretty solid and if they aren't as inflated in price as those Riedel glasses, then that's even better! Hands down, any Cab Sav. Swirling it that round glass with the circles is just so much fun. This may be a crazy (and introductory) question - I've had wine out of Riedel glasses before, and maybe because I haven't done the true test (wine out of my Mikasa glasses vs. Riedel or schoot Zwiesel), but what is the big difference in taste and experience that you can only get from the Riedel that I can't replicate through aerating and decanting prior to the pour in the glass? Honestly, aside from its ridiculously large size, the feature that I like about my Riedel glass is the fact that it has a curved out lip. 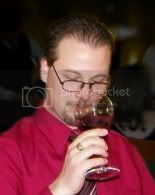 It helps me get my face far into the glass for a sniff without having to worry about spilling or snorting my wine. Other than that, a lot of people claim the shape helps concentrate the flavor/aromas... blah blah blah. In a couple of weeks, I am going to do an experiment with a fellow blogger where we taste a crappy bottle of wine from an expensive glass and an expensive bottle of wine from a styrofoam cup! Pam makes a good point. I suppose any wine glass that exudes the wine's full character should be first choice. Although, I still find it strange to see people drinking from Zweisels and Riedels with their grubby paws groping the body of the glass. What do you drink from Dean? Apologies for the late response - work has been hectic but good to say the least. Love the subtle sharp design which accentuates the wine's full character. Put it this way, if wine tasting was a burlesque show, this glass would be the stage IMO. On the topic of glassware, why not start a post on decanters?